For more than 25 years, she has lightened up the silver screen with her charm. Her style in the movies has been followed by women through the years. After a sabbatical, Madhuri is back in tinsel town and looking even more amazing than her Dhak-Dhak days. ‘Borrow it Bindaas’ decodes Madhuri’s red carpet style for all our readers and just in time for the gorgeous actresses birthday! 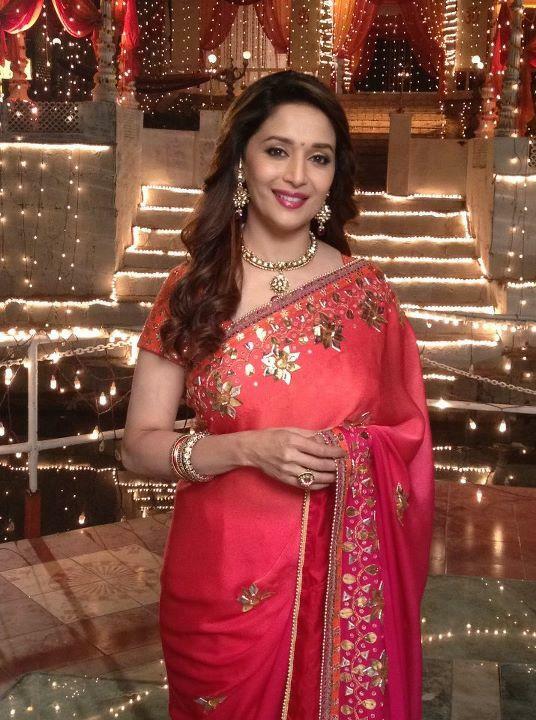 Madhuri mostly opts for a saree when it comes to looking good on the red carpet. The Sleeve of the blouse is kept short in order to give more emphasis to her shapely arms. The pallu of the saree is never pinned up but gracefully left on the side. Vibrant colors like fiery red, hot magenta, forest green, deep sky blue, amethyst purple and bright yellow. These days Madhuri has been looking fabulous in creations of designer Varun Bahl, Sabyasachi Manish Malhotra, Rahul Gandhi-Rohit Khanna and Anju Modi. 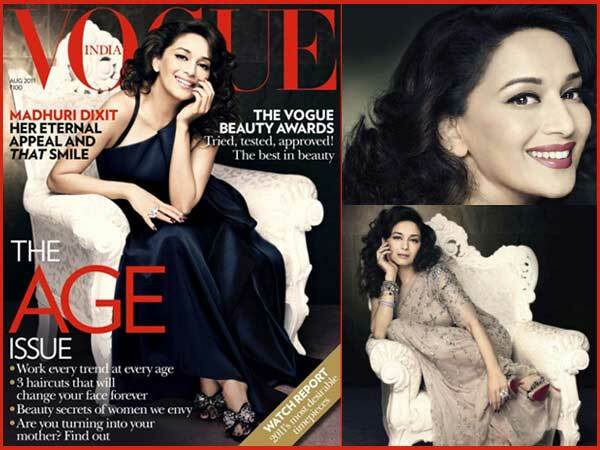 It was a pleasant surprise to see Madhuri don fashionable gowns on the cover of Vogue, Filmfare and fashion award events. She also was seen on the front row in Varun Bahl’s show at Wills Lifestyle Fashion Week 2012 who also designed the saree for her wax figurine at Madame Tussaud’s in London. Anarkalis & short kurtis paired with churidhars also made way in Madhuri’s fashion choices. She definitely took sophistication to another level in these fabulous silhouettes. Growing up we adored Madhuri’s movies and style and are so excited to see her back in full swing in Bollywood! We wish the actress a very Happy Birthday! More of Madhuri’s Looks BIB Loves!